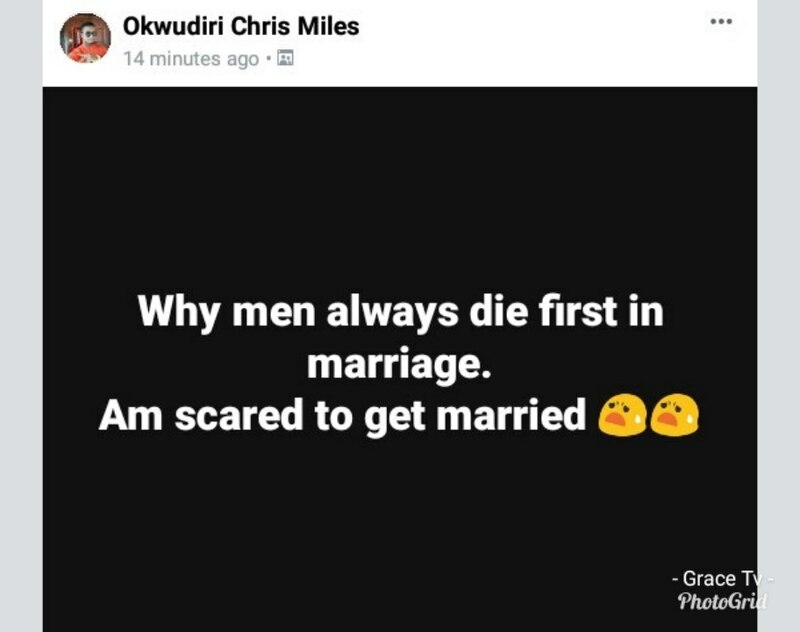 A Nigerian man has stated that he is scared of getting married because ''men always die first in marriage''. 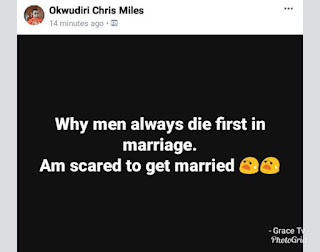 Okwudiri wrote this on Facebook after a report by AFP on Monday, about a new study by the National Academy of Sciences, a peer-reviewed US journal, stated that women tend to outlive men and stay mentally sharp longer, because female brains appear on average about three years younger. Subjects ranged from their 20s to 80s, and across those age spans, women’s brains appeared metabolically younger than men’s, said the findings. And when compared to men, male brains were 2.4 years older than their true ages. “It’s not that men’s brains age faster,” said senior author Manu Goyal, assistant professor of radiology at Washington University School of Medicine, St. Louis. “They start adulthood about three years older than women, and that persists throughout life,” he added. It “could mean that the reason women don’t experience as much cognitive decline in later years is because their brains are effectively younger,” said Goyal.